Oakville Drives: Are you confused about the requirements related to your personal use pick-up truck? There are quite a number of us that own a pick-up truck for personal use only because we like them and/or because we occasionally pull a trailer. In 2006, I bought my ¾ ton diesel pick-up because I needed something strong to pull a 27’ enclosed car trailer to the track. One of my challenges was to try and get a clear understanding of the many “new to me” requirements related to owning a truck and pulling a big trailer. Needless to say, there were many different opinions about the need for an annual safety inspection, daily safety checks and logs, Commercial Vehicle Owner’s Registration (CVOR) and even the weight registered on the truck’s license plate registration. I even went to our local Oakville “commercial vehicle inspection station” on the QEW to get clarity – but even they seemed confused. Playing safe, I got my annual safety inspections on both truck and trailer, obtained a CVOR, purchased a safety log book that I dutifully filled in on a daily basis, and registered (at considerable annual cost) my truck for the combined weight of the truck and trailer. But did I really need all of that? Recently, the Halton Police Commercial Vehicle Inspection team hosted an information meeting for commercial truck drivers interested in learning more about these sorts of requirements. Surprisingly, there were several of us at that meeting that only used our trucks for personal (non-commercial) use – and wanted to get true clarity on what was really needed to stay on the good side of the law. Pat Martin and his two fellow officers did an excellent job at clarifying things for us, as well as informing us of the more common safety inspection failures that they see during their work. So here is what I learned. What is a personal use pick-up truck? 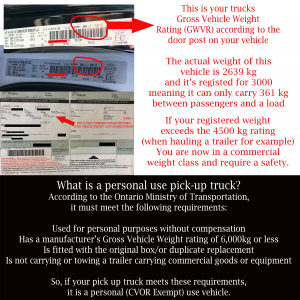 So, if your pick up truck meets these requirements, it is a personal (CVOR Exempt) use vehicle. Do I need a Commercial Vehicle Operator’s Registration if I have a personal use pick up truck? Although the Highway Traffic Act considers all pickup trucks to be commercial motor vehicles, a pickup truck used for commercial purposes (not personal use) only needs a Commercial Vehicle Operator’s Registration (CVOR) certificate if it has an actual or registered gross weight of more than 4,500 kg. Simply put, I don’t need a CVOR because my truck qualifies for the CVOR exemption. How should the personal use pick up truck be registered? The registered gross weight (RGW) determines the fee paid for the black and white licence plates. What is often overlooked is that the truck’s RGW is based on and must be at least equal to the actual weight of the truck, or the truck, trailer(s) and load(s). For many of us that only tow a trailer once in a while, it may seem overkill to have to register our pick up truck for a much higher weight and thus cost. But that’s the law! Because a trailer permit does not have a RGW, you really need to weigh both the truck and the fully loaded trailer (including driver and passengers) to get an idea of the true RGW. The only exception to this is if your fully loaded trailer weighs less than 2,800 kilograms. If so, only the trailer tongue weight, not the weight of the trailer transmitted to the ground, needs to be added to the RGW of the truck. So in my case, the truck registration needs to include my truck’s actual weight, and, the actual weight of the trailer and contents if it is over 2800kgs. Does my personal use pick-up truck need an annual safety inspection and the “yellow sticker” on the windshield? This one is easier to explain. If your truck’s manufacturer GVWR or actual RGW is greater than 4,500 kg, then you need to have the truck inspected each year and get that yellow sticker. If the higher of your truck’s manufacturer’s GVWR, registered RGW or actual gross weight is less than 4,500 kg, but the combination of truck and attached trailer have a combined gross weight, RGW or manufacturer’s GVWR or combination thereof, of over 4,500 kg, both the truck and trailer need to have the annual safety and display the yellow sticker. Simply put, if I’m not towing the car trailer, I don’t need my truck to have the yellow sticker. But, because I tow a heavy trailer that in combination with the RGW of my truck exceeds 4,500 kg, both my truck and trailer need to have the yellow sticker when I tow the trailer. Is all that clear as mud now? If 1(a) above is no greater than 6,000 kg, and your truck qualifies as a personal use vehicle, you do not need a CVOR. If 1 above greater than 4,500 kg, you need an annual safety inspection and display a yellow sticker. If any combination of 1 and 2 above, are greater than 4,500 kg, both truck and trailer need and annual safety inspection and display the yellow sticker. The Halton Regional Police has two full-time and one part-time certified commercial vehicle inspectors, they are an excellent and local resource to contact if you need further clarification or have a special circumstance to deal with. Their contact information is as follows: pat.martin@haltonpolice.ca or scott.oldfield@haltonpolice.ca . They hope to have another information session in the March-April 2017 timeframe for anyone interested in this topic and will post information on actual date/time on their Twitter @HRPSCMV. My thanks to Constable Pat Martin for taking the time to edit this article. In order to save money, some of us don’t increase the weight on our truck’s registration until we get the trailer out of winter storage, and reduce the weight on the registration once the trailer is put into storage at the end of the season.